You can take just one look at these cute shoes and know kids will love wearing them! Elmo, Cookie Monster and Oscar the Grouch - three of the most adorable Sesame Street characters shine in this great new collection! 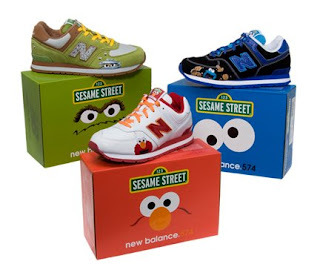 As a sponsor of Sesame Workshop, New Balance introduces these new kicks designed on the 574 Classic Running Shoe. They're all sure to be favorites! With googly eyes and a soft blue fur liner, Cookie Monster is yummy. Elmo's contagious smile stands out and his red fuzzy liner will make kids laugh. On grouchy days or happy ones, Oscar's soft green suede upper and peeking eyes make him a winner. These fun styles are also designed to be comfy so kids can play in them all day long. They come in multiple widths for Infant, Pre-School and Grade School sizes. For a closer look, check them out here at NBwebexpress.com. Let us know what you and your kids think of them! The boxes for these shoes are almost as cool as the shoes themselves. Very nice Kicks.